City of Houston’s Comprehensive Plan Revision Wins APA Alaska 2017 Award | R&M Consultants, Inc.
Mayor Thompson, Steering Committee Members, and R&M Planners Van Le, AICP and Taryn Oleson with the Comp Plan Award. The City of Houston Comprehensive Plan won the 2017 American Planning Association (APA) Alaska Chapter Comprehensive Plan Award. 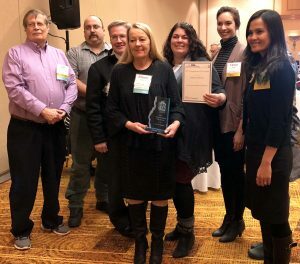 City of Houston Mayor Virgie Thompson accepted the award on November 14 during the APA Alaska Chapter Annual Convention at the Anchorage Downtown Marriot Hotel. This award recognizes a comprehensive plan completed within the past three years that demonstrates an innovative or visionary approach. The Houston Comprehensive Plan used a mix of unique and vetted public involvement and planning techniques to create a plan that is a direct reflection of the community, highly implementable and reaped economic benefits within a year of the plan’s adoption. It serves as a model in best practices for other small community planning efforts. This is the first time the City of Houston assumed responsibility for writing its own Comprehensive Plan since the Matanuska-Susitna Borough wrote Houston’s plan in 1982, with amendments in 1999 and in 2003. For this iteration, the City recognized the value and importance of planning. 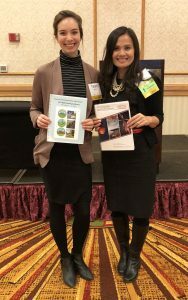 They worked to ensure the revised comprehensive plan is an effective guide for future community success by identifying implementable goals, objectives, policies and strategies for development over the next 20 years. R&M Project Manager Van Le, AICP and Planner Taryn Oleson at the Award Luncheon. The success of the plan is due to the strong community participation. An empowered Steering Committee made up of residents, business owners, Planning Commission and City Council Members, worked tirelessly to ensure a balanced representation of the community was involved at each stage of the planning process. They were advocates for the plan during its creation and adoption, editors and contributors as it was written, active participants at every public workshop and meeting through facilitation and outreach, and ensured key stakeholders were involved. R&M led development of the plan revision, working closely with the City and community. The planning process included a reevaluation of the current plan and existing conditions, updated population projections, goal setting and needs assessment through a community survey, land use analysis (including a build-out analysis) and a GIS mapping-based scenario planning for future growth.